McBride’s really designed their RV storage facility for the RV owner in mind. The design features speak loudly to what customers want and what they need in a vehicle storage facility. 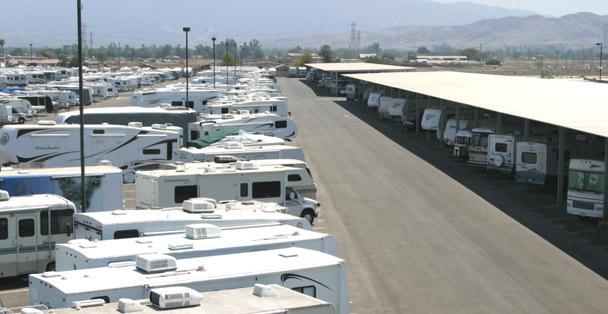 The RV parking facility is spread out over 17+ acres. You will find extra wide driveways, 30 degree angle parking, and large turning radiuses throughout the facility. McBride’s offers approximately 1,000 spaces either covered or open parking. Spaces range in a wide variety of sizes and types like pull through spaces. McBride’s can accommodate everything from a single jet ski to the largest of luxury motorhomes. An underground water detention system collects every drop of rain (up to 1 million gallons), filters it, and slowly lets it drain to the storm drain. This keeps our facility environmentally clean, and prevents flooding and potholes from developing. The facility is completely paved, so that RV owners don’t have to worry about rodent infestation. Customers enjoy the wider spaces making maneuverability easy even for the novice RV’er. The extra wide drive isles design makes the facility feel user friendly. All spaces are lined and numbered clearly identifying your space.